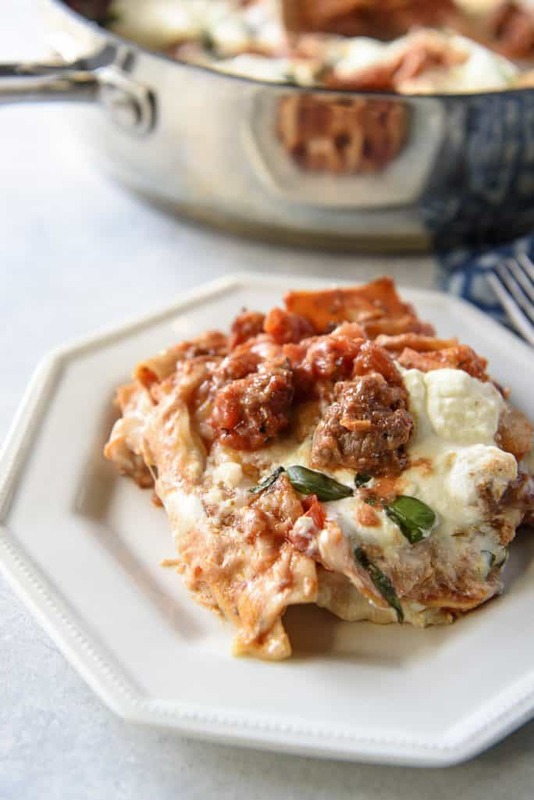 Layers need not apply in this easy weekday Skillet Lasagna! 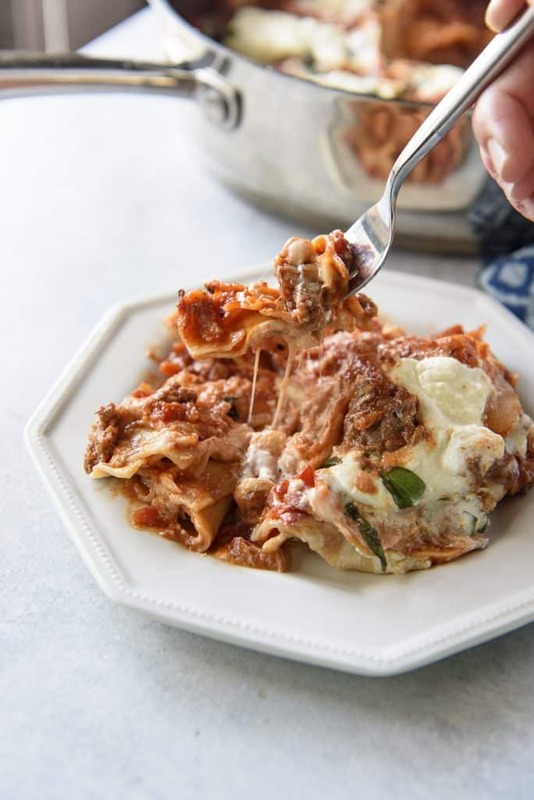 This deconstructed lasagna serves up all the flavor of your favorite Italian dinner in less time and with much less work. Who’s ready for a lazy dinner!? I, for one, am always down for a set-it-and-forget-it slow cooker or Instant Pot meal, but there’s definitely something equally alluring about skillet dinners. For a little bit more effort than tossing everything in a pot, you’re rewarded with a homestyle meal that you can feel stick to your ribs. In a totally good way. 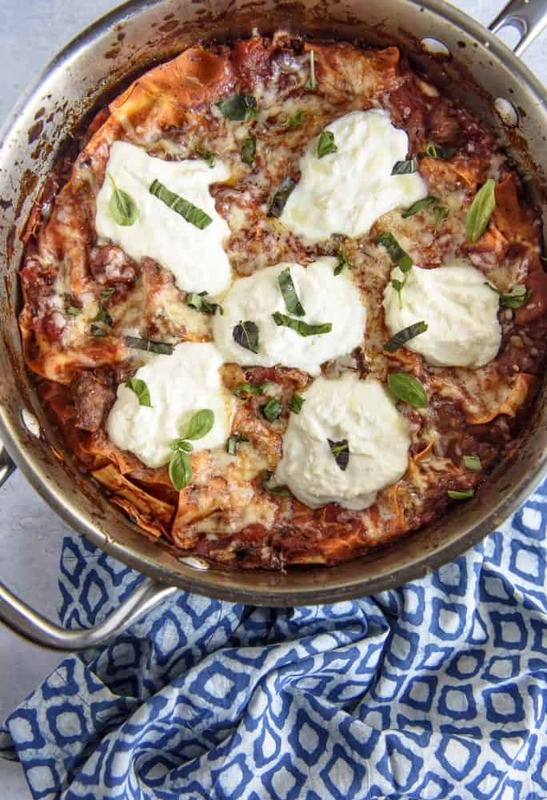 As a totally unforgiving carboholic, I can promise you that you’re gonna love this one pot lasagna recipe. JUST TAKE ME TO THE SKILLET LASAGNA ALREADY! 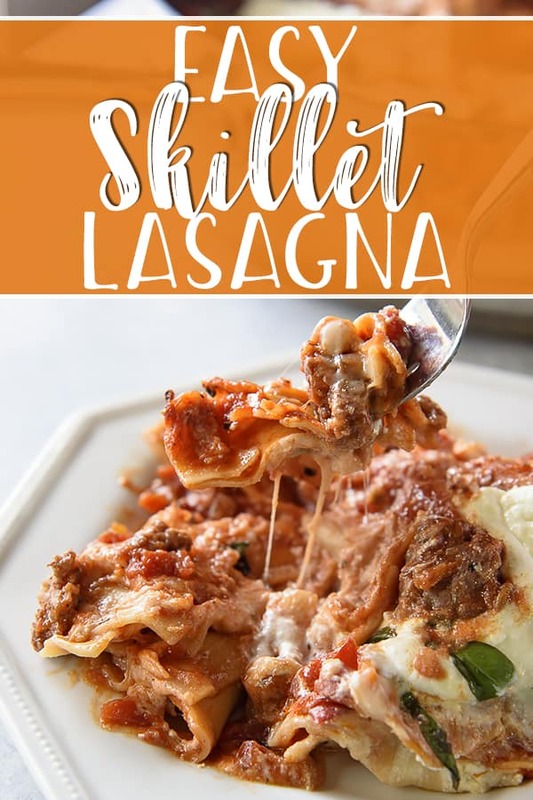 If you’d rather skip my (pretty darn helpful) tips and tricks, essential cooking info, and similar recipe ideas – and get straight to this deliciously easy one pan lasagna recipe, just scroll right on down to the bottom of the page where you can find the printable recipe card! I will never say no to pasta. Considering that I have like 1.23% Italian in me, this adoration for noodles that I have should be a little tamer. There’s no denying, though, when a plate of penne or pappardelle is around, I’m instantly salivating. Red sauce, white sauce, pesto, no matter. I’ll eat it all. My waistline has never appreciated this diet preference. I don’t know about you, but lasagna has always been one of those dishes I adored but never made simply because of the work involved. Layers? Parboiling? Nah. Baked ziti gratifies much quicker. Deconstructed lasagna, on the other hand, is absolutely the best way to enjoy lasagna for mostly lazy cooks like moi. And you, obviously, since you clicked on this recipe. As always, no judgment from me. I run a food blog and am admitting to being a lazy chef. I’m all about the cheese in my lasagna recipes, and this one isn’t hurting for it. Mozzarella, generous dollops of ricotta, and freshly grated Parm will satisfy the dairy lover in you, but a little bit of protein doesn’t hurt, either. I made this batch with some leftover spicy Italian sausage I wanted to use up, but ground beef, chicken, or pork would be yummy in here, too. If you’re feeling particularly adventurous, venison sausage would be pretty amazing. 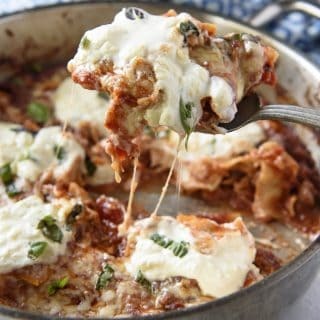 I’d love to hear what other meats you put in your lasagna! 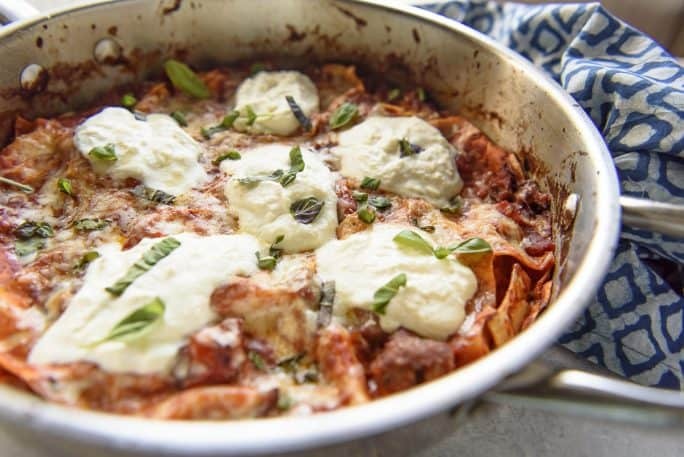 This easy skillet lasagna recipe is definitely going to be added to our “what do we want for dinner” menu. It’s a bit larger than the dinners I’ve been making, at about 4 servings, but having leftover pasta in the house is never a bad idea. As it turns out, second-day skillet lasagna is just as good as second-day spaghetti. Well duh. In a large skillet, heat oil over medium heat. Brown sausage 3-4 minutes, breaking it up as it cooks. Add shallots and garlic and cook 2-4 minutes until softened. Splash in the wine and deglaze the pan, scraping the brown bits from the bottom and stirring them into the mix. Reduce heat to medium-low and add the diced tomatoes, sauce, Italian seasoning, and red pepper flakes. Season with salt and pepper to taste, then bring it to a simmer for 5 minutes. Break the lasagna noodles into 3-4 pieces each and scatter them in the skillet, stirring gently to cover them with the sauce. Make sure the noodles are flat in the skillet, then top with mozzarella. Transfer skillet to preheated oven and bake for 25 minutes. Remove skillet from oven and place large dollops of ricotta on top of the melted mozzarella. Sprinkle on the grated Parmesan, then return the skillet to the oven for 3-5 minutes, broiling if desired for a browned top. 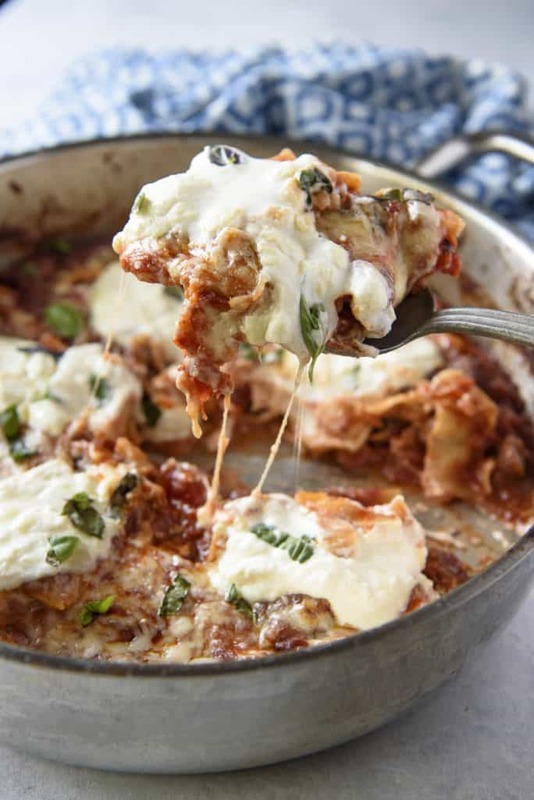 PIN THIS ONE POT LASAGNA RECIPE FOR LATER!